The action is great, the story is interesting, and there is plenty of comedy to go around. Another solid outing from Marvel, this movie is a lot of fun. We get great action and effects coupled with a lively story about a thief and the man who hires him to help stop a corrupt scientist trying to make a very dangerous breakthrough. This movie is an action-comedy and boy did they cast it well. Paul Rudd is the star and he gets plenty of help in the comic relief department from Michael Pena. Then there’s the dynamic between Michael Douglas and his daughter Hope Van Dyne, played by Evangeline Lily, and a number of heist robberies. The movie keeps you engaged and entertained at all times. Ant Man is another success story for Marvel. This studio really can do no wrong. Even if some things don’t work about a movie that they put out, there’s always so much more good than bad, so much more cool than boring, that it never even comes close to being a poor film. Such was the case with The Avengers: Age of Ultron from earlier this year. There were plenty of problems, and yet they still barely held the movie back at all. Not with everything else that the movie was doing right. 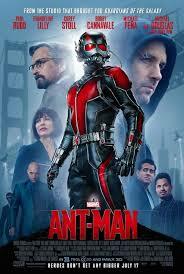 And now, with Ant Man, we get a film that does not have plenty of problems. The movie has fun characters, a lively story, some really cool action and effects, and humor that generally works. What more can you ask for? At the start of the film, we meet Hank Pym back in the seventies, (as played by a digitially altered Michael Douglas.) The actor looks amazing here. He looks just like Douglas really did all those decades ago, when he was at the height of his career. Aside from seeing this really neat anti-aging computer effect, we also get some familiar faces in the scene to help tie the Marvel Cinematic Universe together. There’s an older Peggy Carter (Hayley Atwell), and also Howard Stark (as played by John Slattery, the same actor who portrayed him in Iron Man 2.) It’s kind of cool seeing these actors in this scene, who have portrayed the characters in all different movies, but never together in the same film before. 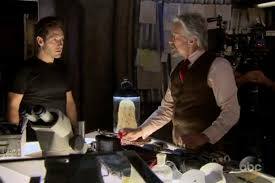 The main thing that the flashback does for us is it establishes the Pym particle as something that Hank comes up with which has the ability to change the size of objects or people. It can shrink them and it can blow them up, and Hank doesn’t want his invention coming anywhere near S.H.I.E.L.D. It is just too dangerous and who knows if the particle could wind up in the wrong hands (we know from Captain Amercia: The Winter Soldier, that Pym was right to be suspicious, since S.H.I.E.L.D. and Hydra had more connections than anyone knew about at the time of this flashback.) I really like that it’s not just about shrinking, but that there are also disks that make things much bigger. These are used nicely towards the end of the movie, to have a little fun. We now move ahead to the present day and meet Scott Lang (Paul Rudd), while he is finishing up his sentence in prison. He is locked in there, serving time, for doing some sort of Robin Hood thing where he hacked into the computers of people who ripped others off and returned the money to its rightful owners. So he’s a guy who has a criminal record, but really has a heart of gold. It’s a little corny, but who cares? Just starting him out in prison makes him an anti-hero, just like the usual Marvel protagonist (Tony Stark, Starlord from Guardians of the Galaxy.) And now, with Lang out, he tries to get a job. We watch Lang try to pass as a regular guy working at Baskin Robbins, and it doesn’t work out. When the company finds out about his criminal past, he is given the axe. Just watching our lead actor working at Baskin Robbins, and hearing all of the scenes of dialogue that go with it, makes for some pretty good humor. Lang has a daughter that he has been cut off from seeing. He needs to get a job, start paying alimony, and prove to his ex-wife that he is a decent and responsible guy, before she will let him see his little girl. The problems Lang faces with trying to get employment, however, are not making this easy. With the need to start making money, and the difficulty of getting a job, Lang is lead back into the criminal world of robbery. His friends have a job for him to pull off, and Lang wants in. Luis (Michael Pena) is the funny one amoung the trio of jokesters and clowns. Not all of his jokes work, but there’s one particular one which is perfect. It’s when he tells Lang about a message he heard get passed around from one person to another about a job. With each new person we come to, the camera zooms in quickly to their face while Pena continues to speak in voice-over. And it’s his voice that is heard through the mouths of these other characters, while the actors are doing some fantastic lip -synching. Now, we’ve seen moments like this before, but it’s usually used for one quick flash of someone saying something, like on Seinfeld, with the Menaige A Trois episode. But it has never been used this much (so many characters lip-synching in a row), or this well. The movie knows what it has here, and gives us another shot of it later on in the film as well. Lang takes the job that his friends know about. Along with their help, he breaks in to a mansion, beats the vault, and finds an unusual motorcylce suit. All of these actions are well-choreographed, and in fact, the getting of the suit is the best heist in the movie. The vault itself has all different stages to get passed. When he does get in, Lang is frustrated that there is no money there, and so he takes the suit. He then gets home and tries it on. The scene in the bathroom, with Lang first experiencing the effects of the suit, is fantastic. He instantly shrinks down and lands in the bathtub right as the water is being turned on. A pretty fun action sequence follows, with the water throwing Lang all around the tub and eventually out the window. This is our first experience with the shrinking effects and they really look great. Marvel went to great pains to get this right, and it definitely shows. As Lang is becoming Ant Man, learning to use the powers, and figuring things out, there is a scientist who is now in control of Pym’s former company. This is Darren Cross (Corey Stoll,) and he is a bit of cartoonish bad guy. Not that there is anything ridiculous about him, but Cross just seems a little too evil. When a man has doubts about what Cross is trying to do, making attempts to create something similar to the Pym particle, Cross uses a device on him that turns the man into a splotch of blood. It’s equally cool and gross, and a bit of a risk for Marvel to be doing in this family-friendly film. I like it! Cross is given a slight bit of motivation when he has a scene with Pym later on and asks Pym why the older man never trusted him, but even still, this guy just seems too evil. It’s not a big deal, but there definitely seems to be some build-up missing, that would have made this better. In Iron Man, we pretty much got the same level of evil from the Jeff Bridges villain, Obadiyah, only there it was understandable, because the movie took its time getting to this and developing it. Long before we learned the truth about Obadaiyah, we sensed how important money and the business was to him, including his action of having Tony Stark kicked off the board of trustees. In Ant Man, the villain is not given the same level of development, and could have been handled much better. Still, there’s so much to like here that the problems of things that could have been a little better don’t take much away from the positive momentum. Bobby Canavale is a policeman who is the mom’s new boyfriend, and unlike most movies (San Andreas, to name a recent example), he is not a jerk. He’s just a regular guy who cares about this family. As a result, there is no subplot about Lang getting back with his ex-wife. That is a nice relief. I suppose whatever is lost in the villain is made up for with characters like this cop. And he’s hardly the only great character in the film. Hank Pym and his daughter, Hope Van Dyne, are also lots of fun. Michael Douglas in particular, is really putting in effort here, taking this role seriously, and giving us quite a lot to enjoy. He and his daughter have a pretty deep relationship that includes some back story about her mom, which Hope has never learned before. This is where the cool storytelling comes in. The end heist, or attack, is also a little too chaotic. Especially when it leaves the building and takes the fight to a neighborhood house. There are definitely cool elements that come from fighting in a house (the Thomas the Train surprise, when it gets outside, is priceless,) but just taking the movie to this location seems very unrealistic. And the humor is definitely hit and miss. Michael Pena is the funniest of the friends, for example, and even his jokes only work part of the time. Still, the movie has so much likeability that the few things which could have been better are merely side-notes in an otherwise excellent film. I really like the incorportations and references to the Avengers, and then there is also the fun way that this movie uses everyday tiny objects to be looked at from the point of view of someone down on the ground alongside them, just like Toy Story did. This movie is an enjoyable experience that keeps you smiling the whole way through.